Fresh salmon fillets -or steaks- make a fast and easy meal. Not only are they great for a weekly night dinner, but they are also special enough for a dinner party menu! The health benefits of salmon cannot be overstated. It's an excellent source of Omega-3 fatty acids, and baking does not decrease that content. In case you were wondering, salmon is also rich in B12, vitamin D, and selenium, and is low in mercury. Keeping that in mind, if you enjoy seafood, then salmon is a great source of protein for you. Especially this baked salmon. It gets fabulous flavor from minced garlic, olive oil and some chopped fresh parsley. A drizzle of lemon juice provides the perfect finishing touch. 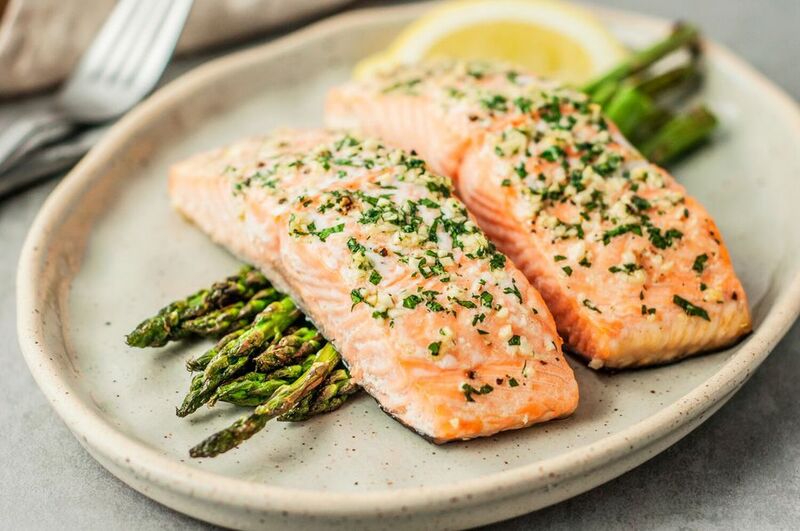 If you're looking to add a bit of extra umph to this dish, we recommend adding some fresh herbs that complement salmon nicely, such as mint, fennel, chives, chervil, tarragon and dill. For serving, consider placing the baked salmon fillets on a bed of sautéed spinach or kale. Or serve them over a base of vibrant pureed peas. Add a simple baked potatoes or roasted potatoes, and a tossed salad for a well-rounded dinner. For wine, a chardonnay or sauvignon blanc pair well with the herb and citrus flavors. Or, choose a pinot noir or rosé, both of which go well with all kinds of salmon preparations. In a small bowl, combine the minced garlic, parsley and olive oil; blend the ingredients well. Arrange the salmon fillets in the prepared baking pan and spread the garlic and parsley mixture evenly over them. Sprinkle the fillets lightly with salt and freshly ground black pepper. Bake the salmon for about 20 minutes, or until the fillets register 145 F or flake easily with a fork. Meanwhile, juice one of the lemons. Drizzle the baked salmon fillets with 2 tablespoons of lemon juice. Slice the remaining lemon into wedges (see below) and serve them with the salmon. The fish is done when you can lift flakes with a fork and the fish is opaque. The US Food and Drug Administration recommends an internal temperature of 145 F. To be sure the salmon is perfectly baked, check with a reliable instant-read thermometer inserted into the center of a fillet. It should read 145 F. To check with a fork, insert it into the center of a fillet and twist it slightly. The center should flake and be opaque, but not dry. To cut a lemon into wedges, slice off the top and bottom of the lemon. Stand the lemon up on a cut end and slice it to make two halves. Cut each half lengthwise into four wedges. Salmon With Garlic and Herbs: Add 2 teaspoons of minced fresh thyme and 1 teaspoon of minced fresh rosemary to the parsley and garlic mixture.